The Otto Warburg Medal (OWM) is an annual prize awarded by the German Society for Biochemistry and Molecular Biology (Gesellschaft für Biochemie und Molekularbiologie, GBM) since 1963. It honours and encourages pioneering achievements in fundamental biochemical and molecular biological research and is regarded as the highest award for biochemists and molecular biologists in Germany. Eight of the prize-winners have received the Nobel prize including the 2013 laureate, Prof. Randy W. Schekman. The medal has been endowed with prize money of 25,000 euros sponsored exclusively by Elsevier and its flagship set of life sciences journals, Biochimica et Biophysica Acta (BBA). The German Society for Biochemistry and Molecular Biology (Gesellschaft für Biochemie und Molekularbiologie, GBM) is the largest organisation for life sciences in Germany. With its almost 5,500 members, it is committed to serving the interests of all those working and researching in the dynamic and promising disciplines of chemistry, medicine and biology – from professors to first-year students. Whether it is the German Research Foundation (Deutsche Forschungsgemeinschaft), journalists, the authorities, or professional associations in other disciplines: anyone needing to call on expertise in questions of biochemistry and molecular biological sciences turns first and foremost to the GBM. 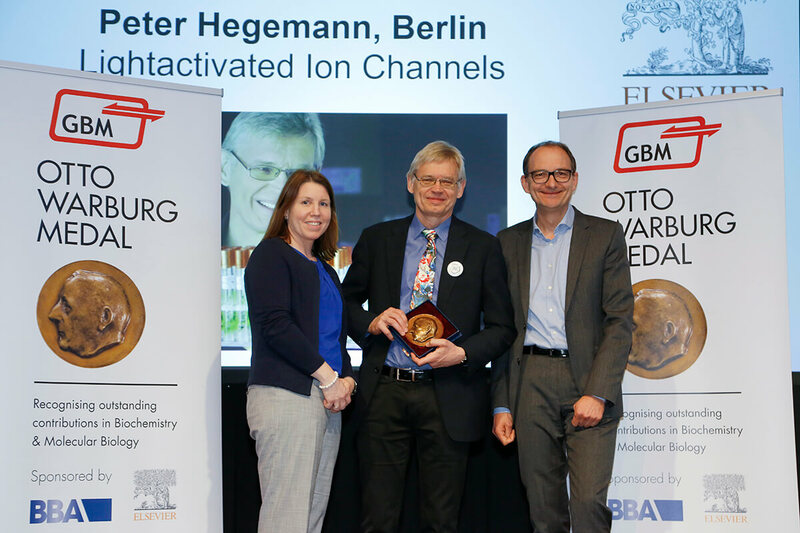 On March 23, The Society for Biochemistry and Molecular Biology (GBM), Elsevier and the flagship set of BBA journals honored Prof. Hegemann for his research in light-activated ion-channels. His insights could eventually contribute to the treatment of neuronal illnesses, which are based on impaired sensory cells – conditions that include Parkinson's disease, autism and schizophrenia. Otto Warburg Medal awardee Prof. Peter Hegemann (center) with GBM President Prof. Johannes Herrmann (right) and Elsevier Publishing Director Andrea O'Brien (left). Read more about Prof. Hegemann's work and how he encourages young researchers to pursue a career in science. For the first time in its long history, the Otto-Warburg-Medal was awarded posthumously to Prof. Dr. Stefan Jentsch on September 25, 2017. 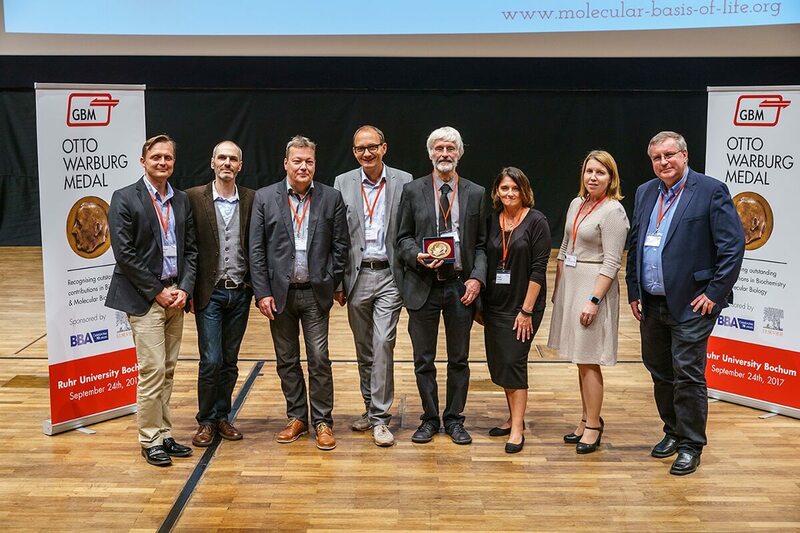 Elsevier's Biochimica and Biophysica Acta (BBA) together with the Society for Biochemistry and Molecular Biology (GBM) honored the cell biologist with the prestigious award for his research on the protein ubiquitin and its role as a molecular switch in a variety of cellular processes. The Otto-Warburg-Medal is considered to be the highest award in the area of basic research in biochemistry in Germany, promoting outstanding scientific excellence and encouraging ground-breaking achievements on an international level in the field of fundamental biochemical and molecular biological research. The prize is intended to commemorate the achievements of the eminent researcher Otto Heinrich Warburg and has been awarded since 1963 while enjoying great international prestige. Previous winners include leading international scholars, such as Prof. Randy Schekman of the University of California, Berkeley and Prof. Emmanuelle Charpentier. Prof. Jentsch's work provided new insights into the molecular mechanisms of the mutagenesis, which are crucial for understanding the development of genetic diseases and cancer. "Prof. Jentsch was an important scientist who will continue to influence modern cell research, even after his death," said Prof. Johannes Herrmann, President of the GBM. "We are humbled to posthumously honor him with the Otto-Warburg-Medal." Sadly, Prof. Jentsch passed away at the age of 61 in October 2016. So his brother, Prof. Thomas Jentsch, accepted the award. The Elsevier/BAA-sponsored prize money of 25,000 Euros, which the Otto-Warburg-Medal is endowed with, will be donated to the organization Doctors Without Borders. The Otto Warburg Medal has been awarded regularly since 1963 by a panel of experts from the ranks of the GBM. Every GBM member is entitled to propose a nominee to the Executive Board of the GBM. The Executive Board of the society deliberates in a closed meeting on the candidates nominated for the prize.